The Phi loves to play on the computer. We have it set up so that she can directly go to her 4 favorites sites. Nick Jr, Playhouse Disney, Hasbro Games, and PBS Kids. We have a separate MAC mouse for her to use because it is just a push down for a click and there is no right clicking. 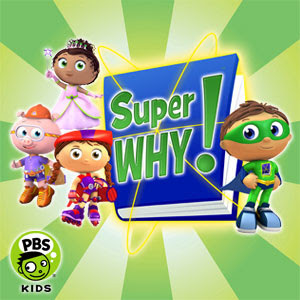 So while on PBS Kids she found this show called Super Why. She would watch small clips and play the games and then asked me to TiVo some episodes for her. Yes my 3 year old asked me to Tivo for her. So I did and Super Why has now become her favorite show. She sings all the songs and even had a dream that we had bought her Super Why shoes. But it was just a dream because it is almost impossible to find anything from this show in the stores. I hunted some bookstores for Super Why books with no luck. Eventually I had to special order a book for her. So we will continue our search for Super Why products because The Phi really loves this how. And it a cute show and its all about reading. And I love reading and I want to The Phi to love reading too. And if a kid in a green spandex and an awesome super computer can help with that. So be it. These looked pretty promising. How was the BBQ? Liam watched this show religiously when he was a little over a year old. I think this is why he knew is alphabet by the time he was 18 months old. He watches it on occasion but he's into "GO GO GO" (Diego) and Dora now.